Some might consider "light Indian cooking" an oxymoron, but this Tandoori Chicken with Homemade Mango Chutney recipe proves that theory wrong! A refreshing blend of nonfat Greek yogurt, minced ginger and spices -trip to a specialty food store to track down obscure authentic Indian spices: not required- make up the classic tandoori rub, which coats the chicken, cooking into a light crust bursting with flavor. While this dish typically usually dark meat chicken thighs to keep it moist; I opted to use the leaner white meat chicken breast. Tandoori chicken is derived from the tandoor clay oven this dish is usually prepared in, but baking in a regular oven or on a grill works too. A light coat from an olive oil spritzer is all you need in the baking pan, eliminating excessive oil and butter heaviness you might find at a restaurant. A note on the color: tandoori chicken's bright red hue originates from a combination of cayenne pepper and paprika, but some restaurants actually just use food coloring to create the fiery color and skimp on the spice! Tumeric, a yellow spice, can make the rub more orange. Although the bright red coloring is really beautiful, be mindful that the taste will be extremely hot. Balance according to your threshold for spiciness. This tandoori marinade is versatile, so feel free to apply to shrimp, lamb, or tofu too. 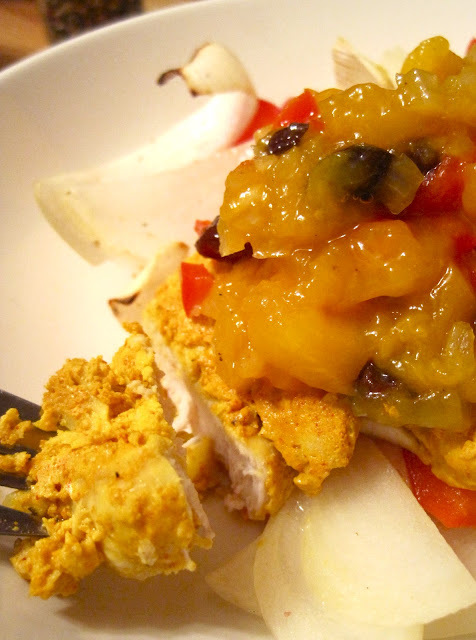 I was so excited to find a mango chutney recipe to accompany the chicken, as I usually buy the bottled kind which is both expensive and pretty calorie heavy due the massive amounts of added sugar. A time-saving tip: buy frozen mango chunks at Trader Joe's at less than $3 a bag to skip the mango peeling and dicing process. I am going to jump over the canning process for the chutney, because it was confusing and involved extra time and effort. I was content that this one-pot recipe had a five minute prep time and 20 minute cook time; you can make the whole thing while the chicken is baking. *use more (plus paprika) to enhance coloring. 1. Combine onion (optional), garlic, ginger, yogurt, coriander, cumin, allspice, cinnamon, turmeric, black pepper, and red pepper in food processor and blend until smooth. To grill: Coat grill rack with cooking spray and preheat grill to high. To bake: Heat the oven to 350°F. Bake for 15-18 minutes, turning once, until chicken is cooked through (checking frequently to make sure chicken does not overcook). 1 1/2 cups (375 mL) granulated sugar I only used 1/2 cup and it was perfect!! 1. Combine apples (optional), mangoes, red pepper, sugar, onion, raisins, vinegar, and gingerroot in a large stainless steel or enamel saucepan. Bring to a boil over high heat, reduce heat, and boil gently, uncovered, for 20 minutes or until fruit is tender and mixture is thickened, stirring occasionally. Add lemon juice, curry powder, nutmeg, cinnamon, and salt; boil gently for 5 minutes.